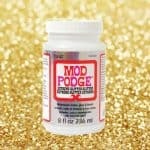 Home / DIY Home Decor / 22 Mod Podge Map Crafts You’ll Have to Try! 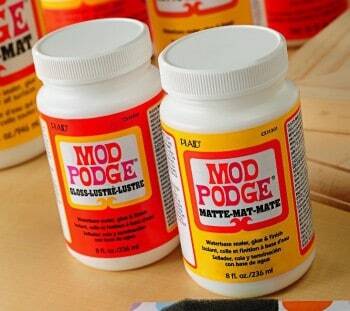 22 Mod Podge Map Crafts You’ll Have to Try! 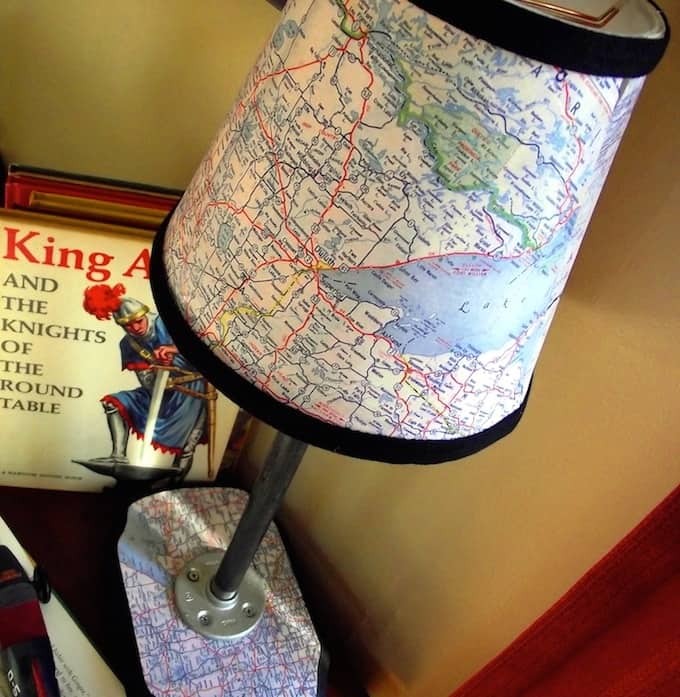 Who doesn't love maps decoupaged to everything? 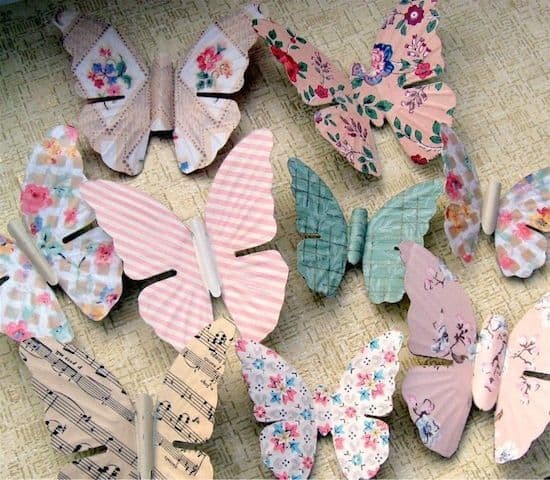 Here are 22 unique map crafts using Mod Podge to inspire you – and to decorate your home. I said it recently in the Mod Podge Rocks Facebook group and I'll say it again here – we should all be decoupaging maps to everything. 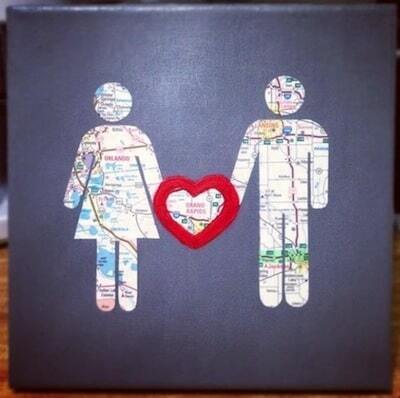 Okay, maybe that's not such a great idea, but I really love Mod Podge map crafts. Aren't they awesome? When I first started thinking about putting together a collection of decoupaged map projects, I didn't realize that I would find so many. I was pleasantly surprised. Scroll down to see 22 awesome projects using maps, and I think you are going to love all of them. 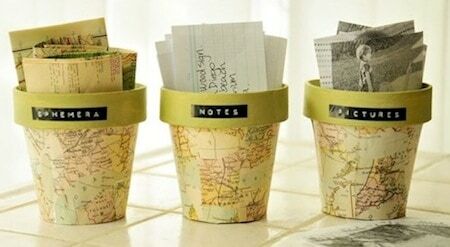 Use these clay pots for storage or displaying memories. 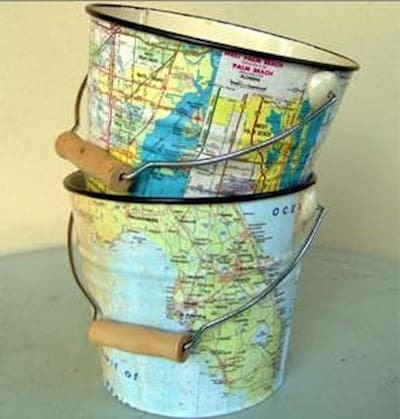 These map pails would be great to use as home decor or even trash bins. 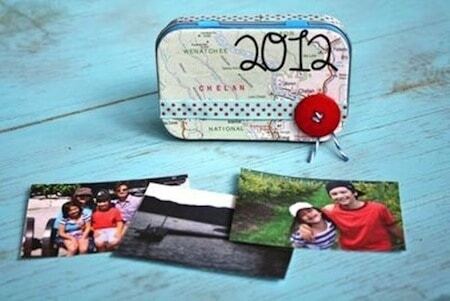 Turn an Altoid container into a small photo album that you can carry in your purse. David shows you how to build a lamp from scratch with a plaque base – then cover it in maps. 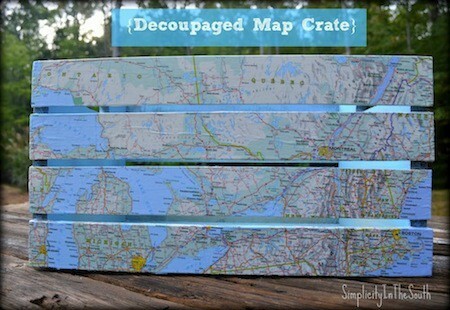 When it comes to map crafts, this is one of my favorites! Customize a desk and filing cabinet set makes the pieces look way better than before. 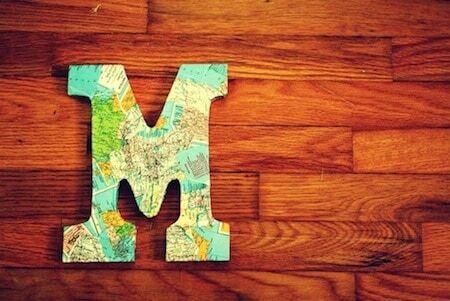 Use vintage map pieces with Mod Podge to decorate this letter for home decor. Map crafts at a party? Of course! 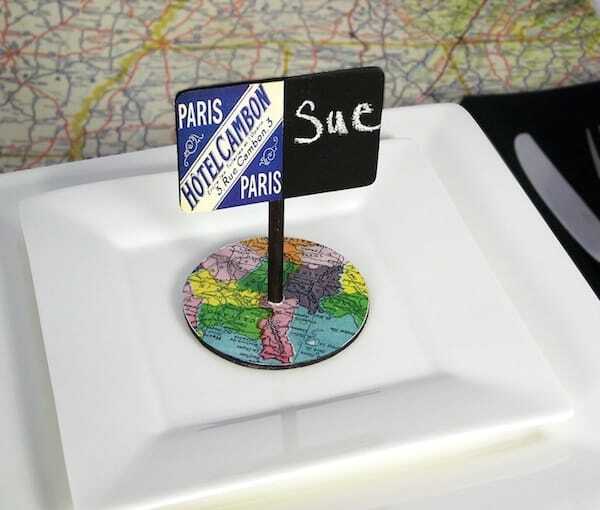 Use chalkboard paint and this free map printable to create these vintage themed place cards. 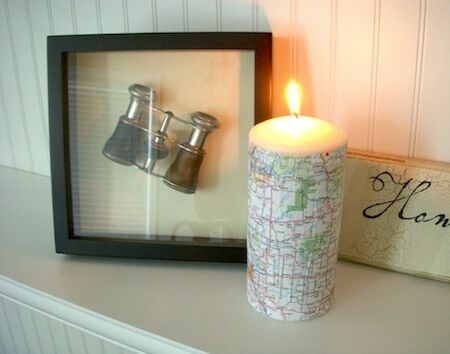 Forgo real wallpaper and use real maps – you can decorate the walls easily just by using Mod Podge. This project is no longer available at Freestylin' Beth, so you'll have to use the photo for inspiration! 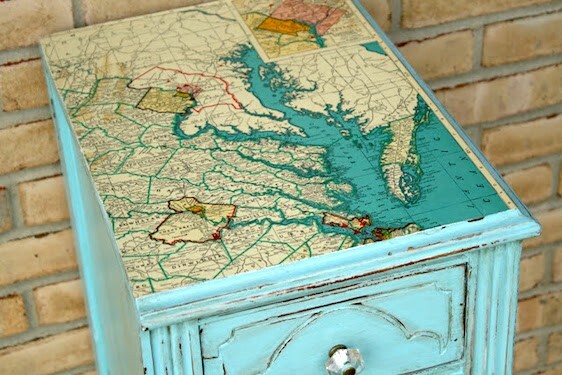 It's easy to re-make a side table or end table into a unique piece using decoupage medium. 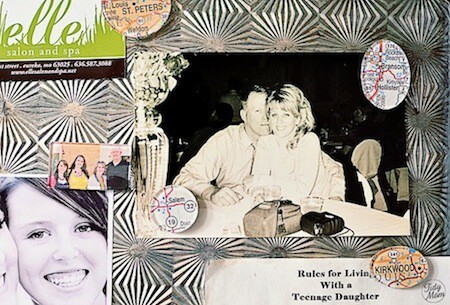 Revamp any frame in your home using pieces of map and Mod Podge – just follow this easy tutorial. This project was inspired by a candle from Pottery Barn – and was made on a budget. 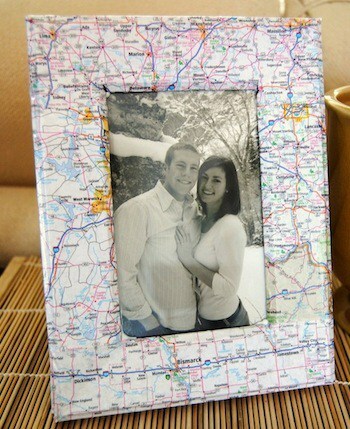 This project is perfect for a newlywed couple, and commemorates their meeting place or wedding spot. 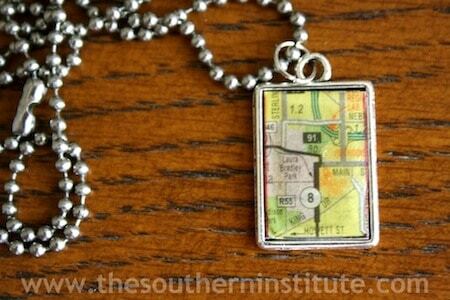 You only need a small piece of map and some jewelry findings to make this awesome necklace. 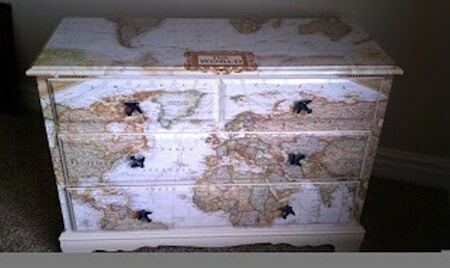 Get a very large map and decoupage to a dresser following this detailed tutorial. 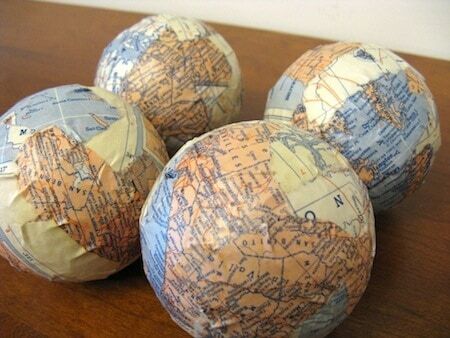 These balls were covered with maps for only pennies – and would be great in a glass jar on a mantel. 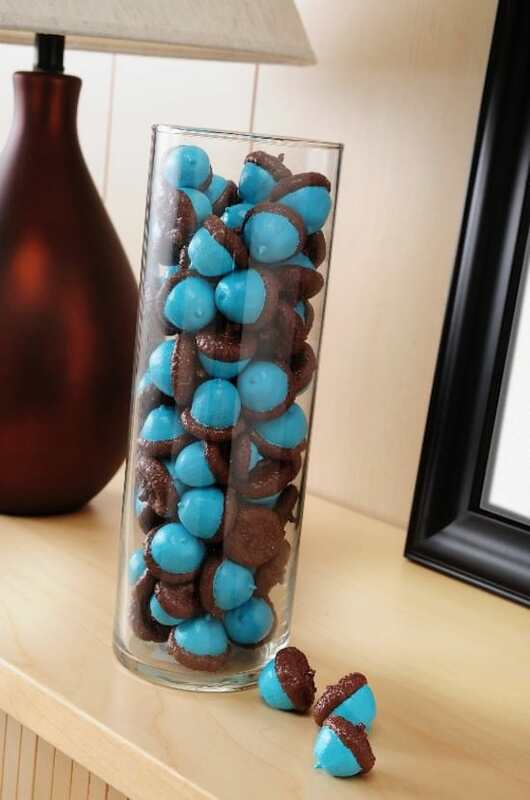 This is such a fun and easy project – even the kids can do it. 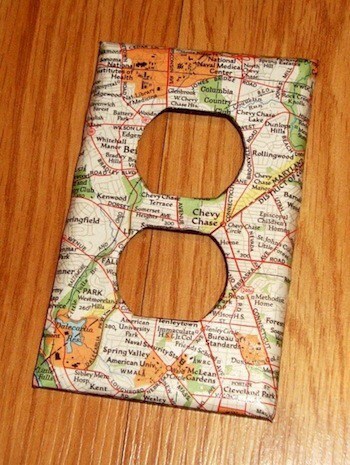 Spice up your switch plates and outlet covers with maps and Mod Podge. 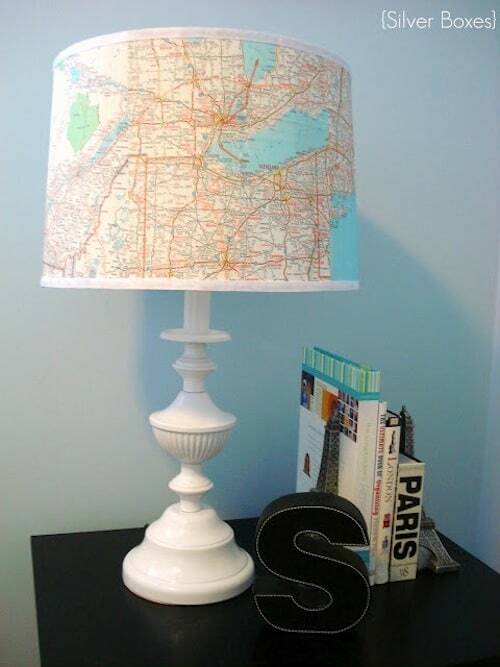 Stephanie found vintage maps for $2 and revamped her lampshade in this cool makeover. 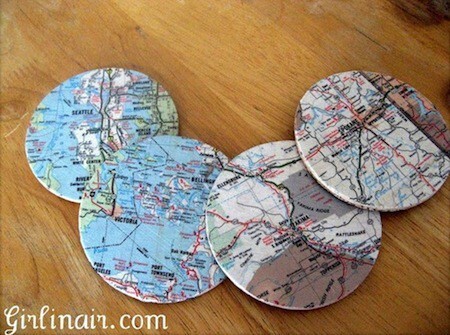 These magnets made with maps and Podgeable shapes would make perfect gifts. 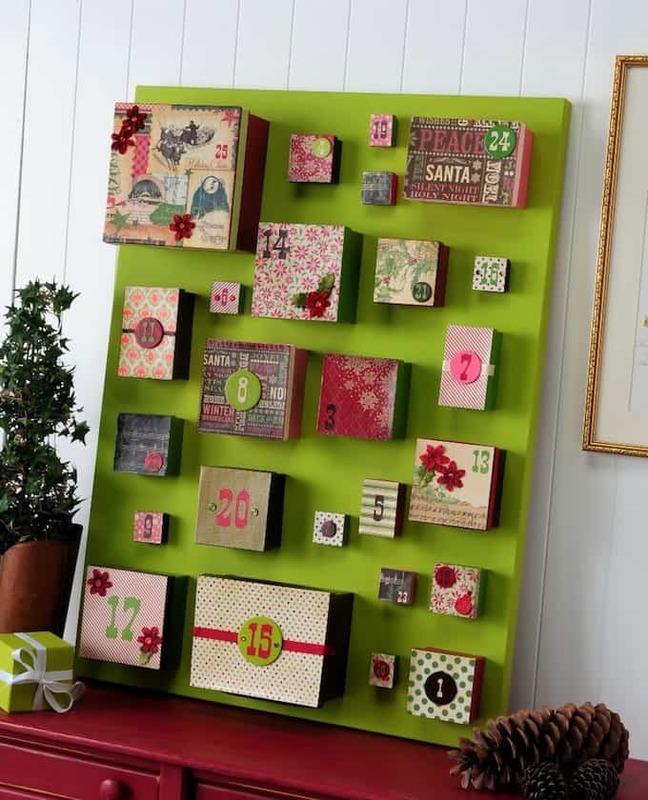 This crate is perfect for toy or book storage in a kids' room. 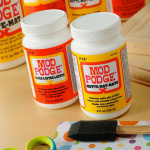 Get a map larger than three canvases – divide and Mod Podge. 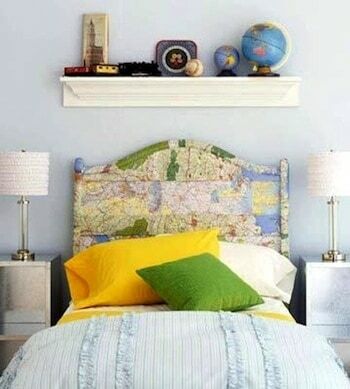 Take map crafts to a new level – use several maps in an overlapping fashion to make this fun headboard. I have lots of AAA maps from our trips – can’t wait to try out some of these great ideas! Great ideas! These are some great tips to try out at the school where I volunteer. 🙂 Thanks for sharing & inspiration. Thanks so much for sharing my map crate. I love this round up! So many great ideas!! 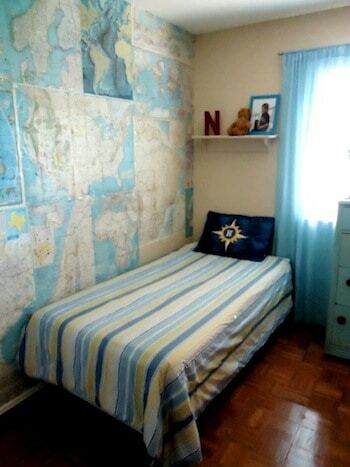 Thanks for including the map wall in my boys’ room. They love it! 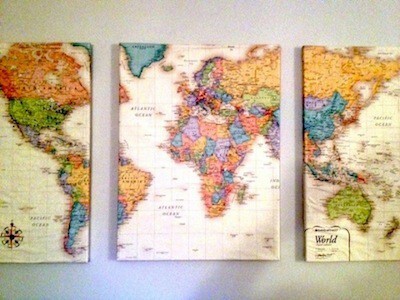 Oh I love all these map crafts!!! Great round-up! I would really like the instructions for making the canvas maps. The link says page not found. Please help, I love this idea! I would love to know where you get your maps. Hi Tonia! You can typically get them from a thrift store . . . or a drug store . . . or you can print up online!